Raise the bar when it comes to snacks. Indulge in milk chocolate while remaining guilt-free with Protein Bar Deluxe – a snack that’s as delicious as it is nutritious! 10 g of healthy protein. Rich, chewy bars help sustain your energy. No artificial sweeteners and just 130/140 calories per bar. 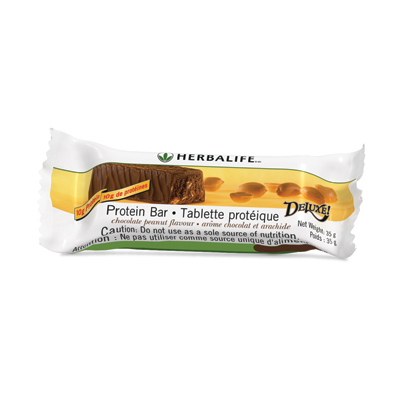 Protein Bar Deluxe contains 10g of healthy protein. Available in three chocolate-covered flavours: Chocolate Peanut, Vanilla Almond and Citrus Lemon. Two bars a day for healthy snacking. Copyright © Herbalife International of America, Inc. Herbalife is a Proud Member of the Direct Selling Association and a Signatory to the DSA Code of Ethics Page layout and form content copyrigh© 2012 Herbalife. No reproduction in whole or in part without written permission. All Rights Reserved. All trademarks and product images exhibited on this site, unless otherwise indicated, are the property of Herbalife International, Inc.